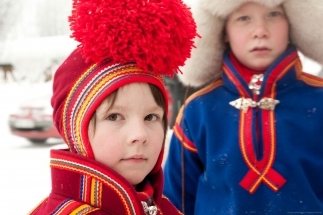 This short break is a perfect combination of visiting Swedish Lapland and enjoying world class Sámi art, music, culture, handicraft as well as great food and atmosphere. 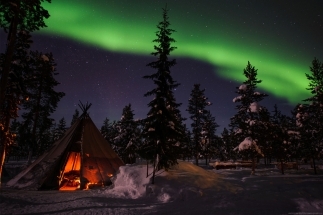 This short break in Swedish Lapland includes a day trip to the famous Jokkmokk Winter Market, one of the oldest market places in Sweden with dates back to middle ages. 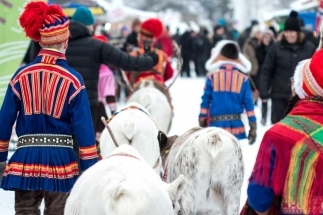 It’s the biggest sales opportunity of the year since 1605 for the Sámi traders to make contacts and see old friends, while you can experience the widest collection of Sámi handicrafts in the country, folk dance, traditional music (Joik), reindeer rides, lectures and taste local food. In addition to this unique day trip to the more then 400 years old Jokkmokk Winter Market. 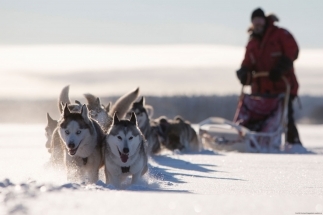 You will visit an learn more about the UNESCO World Heritage site Gammelstad and experience one of the most iconic activities possible in Swedish Lapland a dog sledding tour with Husky’s! The UNESCO site Gammelstad is located about 10 km more inland then Luleå and it’s the districts’s main cultural symbol. It’s the best preserved church town in Sweden. Beside the planned activities there will be enough time to enjoy the city of Luleå on your own. The entrance to the ice track where Olympic speedskater Kjeld Nuis set a new world record as fastest man on ice 93 km/h is on walking distance from your hotel. The track is about 10 km long and except ice-skating its very suitable for making a walk and absorb the winter scenery. If you are interested in doing activities like snowmobiling or a joining a guided snowshoe walking tour we can easily arrange this for you. The surrounding of Luleå offers many possibilities to enjoy the outdoors. In the evenings it’s possible to join a Northern lights tour you will be taken off the beaten track and chase together with an experienced guide one of the most mysterious and profound phenomena the world has to offer. 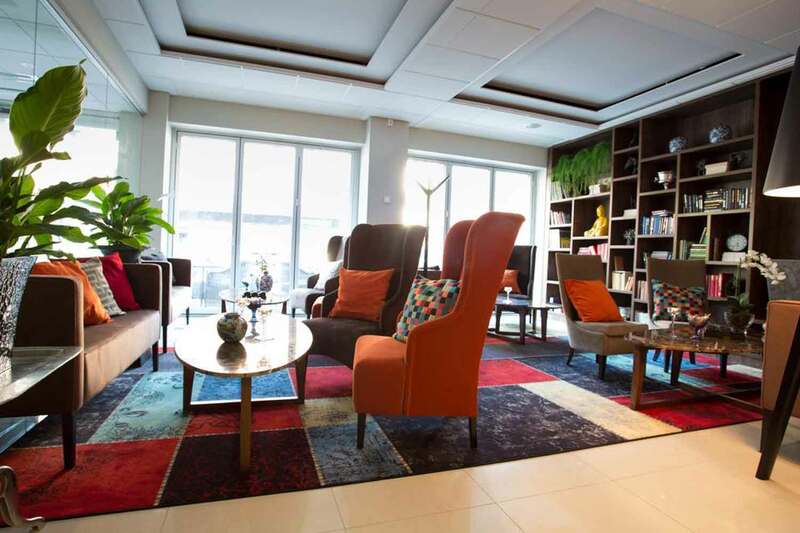 During your visit to Luleå, Swedish Lapland you will stay in the Best Western Plus Savoy Hotel. 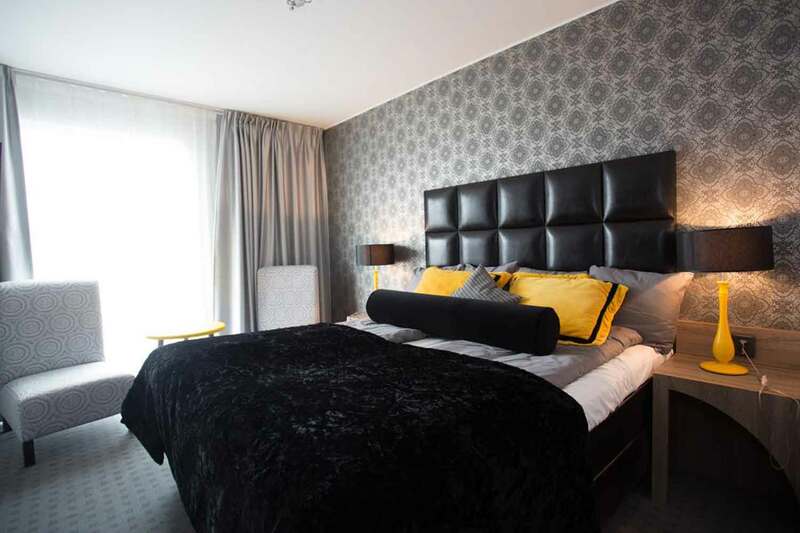 This 4 star modern hotel in boutique style is located on ‘Storgatan’, Luleå’s main street. Offering free spa, entrance to the gym and a modern restaurant and bar. The spa includes 2 hot tubs, a steam sauna, a traditional sauna and an ice shower. Your stay in the hotel is including a daily served rich breakfast buffet. Arrival at Luleå airport based on your flight schedule, you will be welcomed by our local guide. When walking outside the airport you enter a winter wonderland, fresh air, minus temperatures and a snow covered landscape. On the short drive (9km) to your hotel in the city centre, you already get a good impression from the impressive Luleå river as you will cross the bridge which connects Luleå with the southern mainland. Check into your comfortable 4 star hotel and depending on your arrival time you can choose to relax, visit one of the trendy cafes or restaurants in the city centre or maybe explore the nearby ice track on the frozen Luleå River. After breakfast, we will take you for a guided tour to the UNESCO World Heritage Site Gammelstad, the best preserved church town from Sweden. Together with your authorized guide you will walk through the labyrinth of narrow streets in between the more than 400 old charming and red colored cottages. Most of the church town is still in the same style as a few hundred years ago. Our guide will share with you the culture and history of Gammelstad, and you will have the chance to enter the old stone church outstanding in Gammelstad since the medieval period. There are no activities planned for this midday or evenings. If you are interested in doing activities like snowmobiling or a joining a guided snowshoe tour we can easily arrange this for you. The surrounding of Luleå offers many possibilities to enjoy the outdoors. In the evenings it’s possible to join a Northern lights tour you will be taken off the beaten track and chase together with an experienced guide one of the most mysterious and profound phenomena the world has to offer. Today will be an early breakfast. 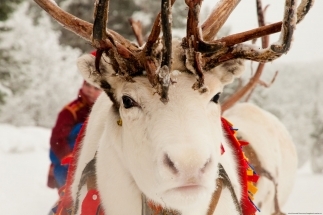 The fully equipped bus will leave at 8.00 from Luleå to the Jokkmokk Winter Market. 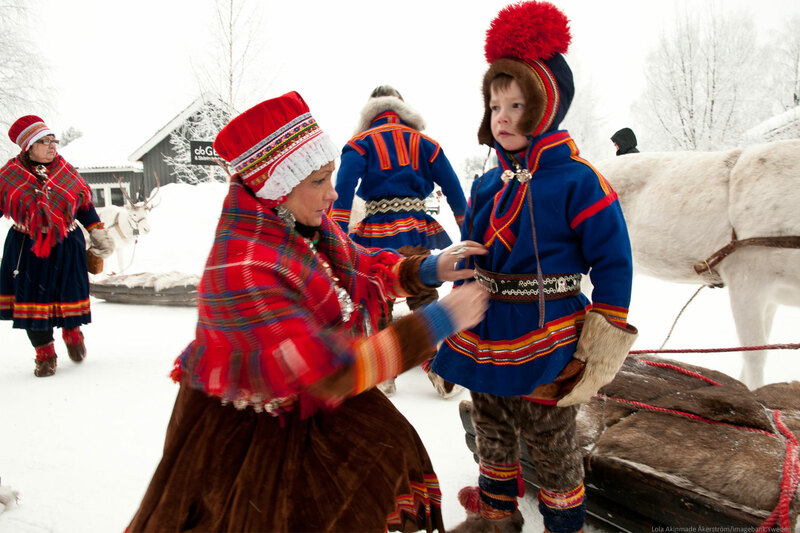 When arriving at Jokkmokk you find your self in the middle of Sami Culture. 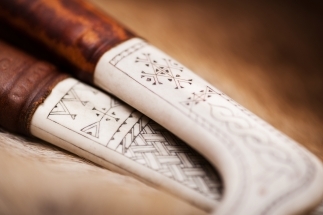 Meet the people of Sami, their unique handicrafts of silver, forging, tin and all kind of reindeer products. Cultural events as theatres, reindeer racing fills the market and makes the visit a unique experience. It’s not only the central market place where the activities take place, there are much more earea’s to explore. To prepare your self in the best way a program with map from the area will be available in your hotel. We also suggest that you visit Ajtte – the Swedish Sami and Mountain Museum, here films, lectures, shows and entertainment takes place. Around 17.00 the warm and comfortable bus will bring you back to Luleå. After enjoying your Scandinavian breakfast buffet you will be picked up at your hotel for the transfer to the husky farm. 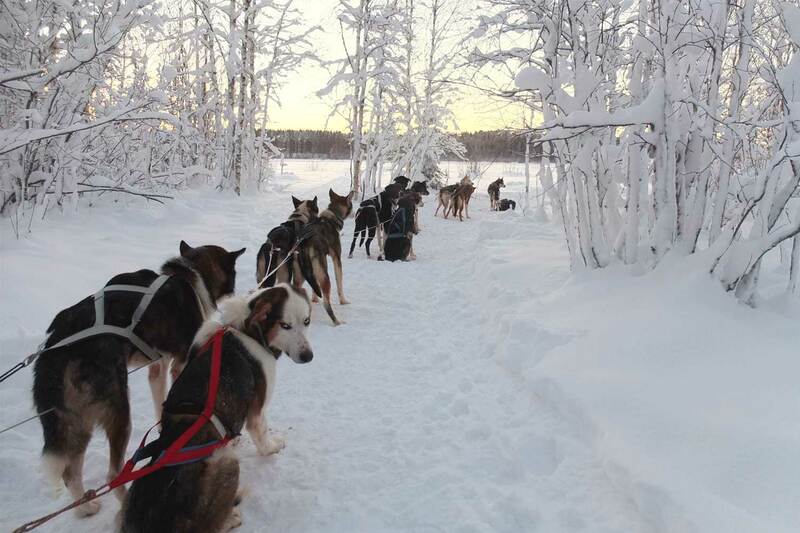 The dog sledding location is about 20 minutes drive outside Luleå. As soon as the dogs notice you, they are enthusiastic and all eager to go. 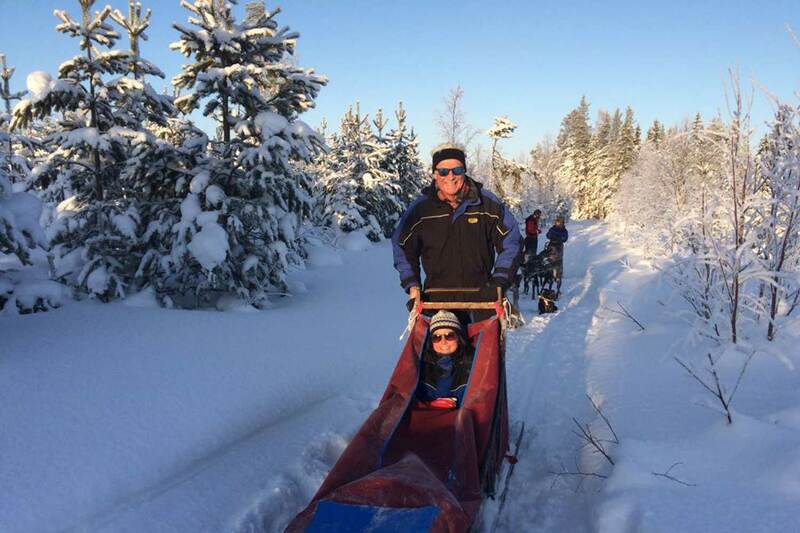 Going on a dog sledding tour through Swedish Lapland is a unique experience in many ways. After a safety briefing and instructions, you can choose to sit on the sledge and let the guide be in control or you can choose mushing your own dogsled team! The tours will go over frozen rivers and through wild forests, offering a great opportunity to see wildlife on the way. 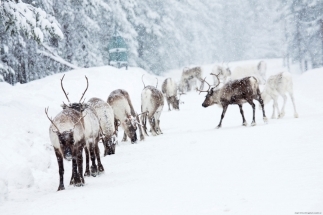 If you are lucky you might even spot reindeer or a moose on your trip. After daily having new experiences it’s time to travel home. Depending on your flight schedule your transfer will be ready to bring you to Luleå Airport. You can look back on an amazing five days visit to Luleå- Swedish Lapland. You have chosen Jokkmokk Winter Market. Select here your arrival date 5 February, to continue your booking.